Another new one for me - a Timex. This is no ordinary Timex though. It is an electric, run by a battery and from 1965. I am breaking from what I usually collect (fully mechanical watches) so not only is the watch is new to me, the type of movement is new to me. In addition, there is no visible crown to set the time on the hands. Officially called a Timex Electric back-set. Instead of a spring to generate the power like that in a fully mechanical watch, the power in electric watches come from a battery. 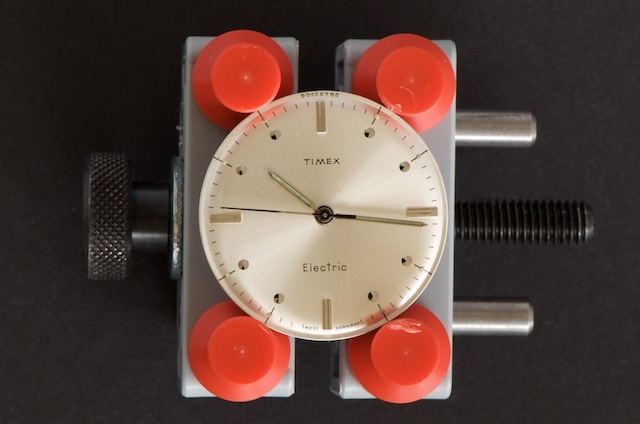 Not to be confused with quartz battery powered watches (they came at the end of the 60s/70s), this is no quartz watch. 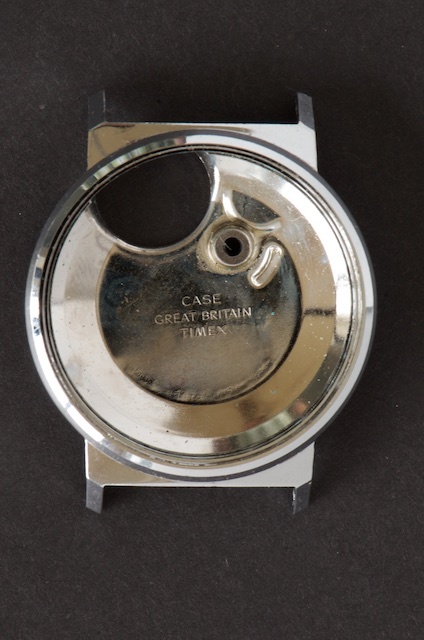 While Timex was an American company at the time, the movement was made in West Germany and the case in the UK. 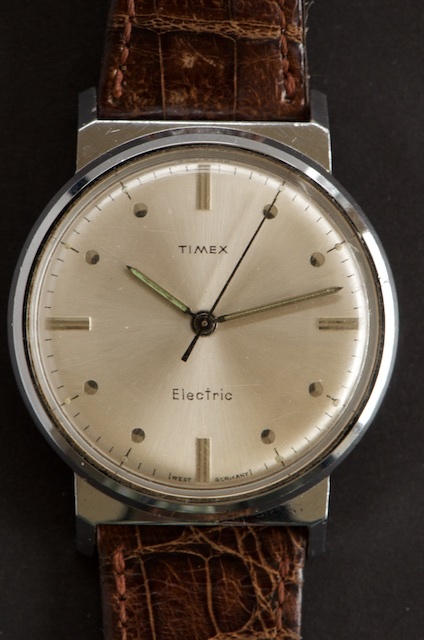 Apparently Timex bought the company that made the West German movements as they wanted to enter the market for these types of watches quickly and the company making them was simply purchased by Timex. I found this particular watch at one of the antique stores in Ladysmith on Vancouver Island that we visit from time to time. They are primarily antique furniture retailers, but yesterday, I found this one sitting in a display case. It is hard to make out with the size of the photos on my blog but there are a series of numbers in the above photo that are just above the 12 o'clock position. These number indicate the year of manufacture and the model number. Well, I got it apart as you can see from these photos, getting it running was easy (new battery) but putting it back together, not so easy. I was the one taking a licking on this one! The most difficult part was putting back the crown onto the setting post; apparently they have to be precisely lined up in order for the crown to sit flush with the back of the watch. The setting crown is on the back of the watch, adding to the uniqueness of this watch. The crown is usually sticking out of the side of a watch. 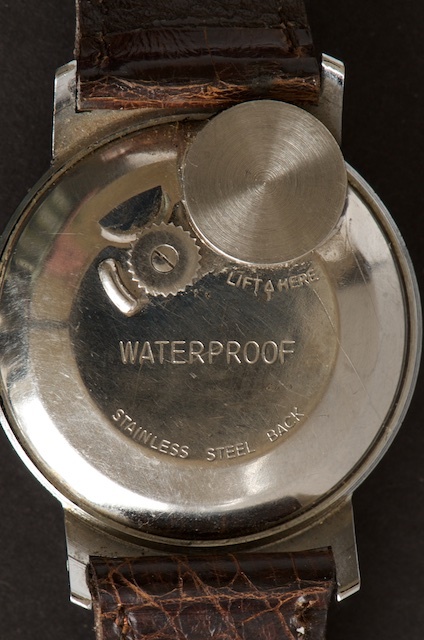 If you look closely to the watch back picture above, you can see the setting crown is the one with the ridged wheel with a screw in the centre. If you remove the screw and then the crown (which you have to to take apart the watch), you'll see a post sticking out of the watch case. It's the post and crown that need to be precisely lined up for the crown to sit flat on the back of the watch. It took me some time with the watch apart to find out there was a specific orientation needed. 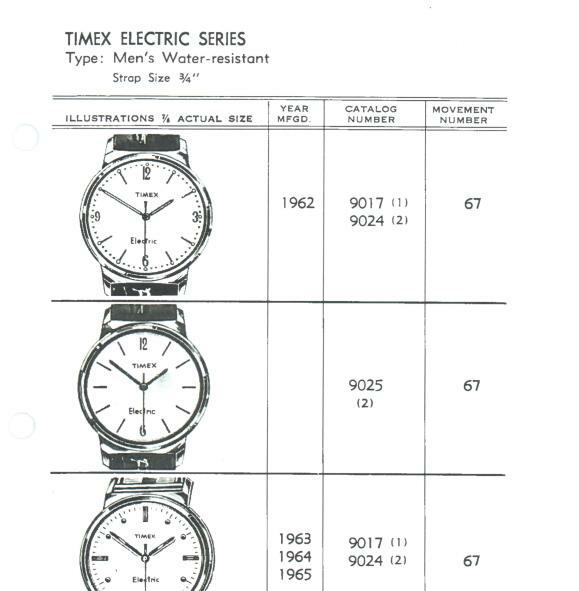 I managed to track down a Timex catalog page (see picture below) that shows my watch and particular dial. From the watch page you can see there were three different dial patterns. Mine is the one on the bottom. So, according to the numbers on the dial above the 6 o'clock position and the confirmation of the catalog page below, my watch is from 1965. 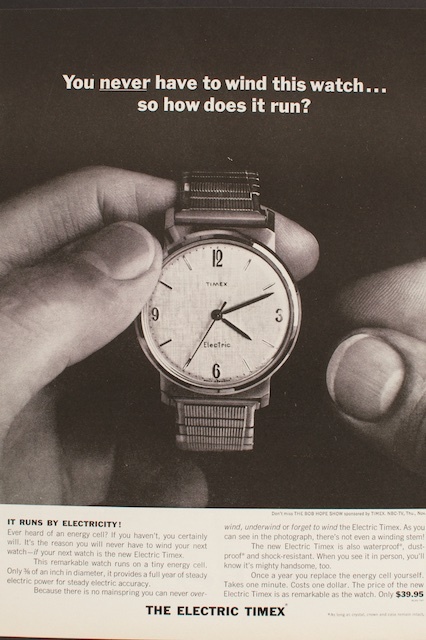 I also found a vintage magazine add below with the Timex Electric. While it doesn't have the same dial as mine, it is definately the same watch case and movement inside. This add from 1962 shows the watch going for $39.95; that's over $300 today. I can say I didn't have to pay $300 for it yesterday. As a matter of fact, if this is what I believe to be an add from a US magazine, I basically paid about the same as it was back in the 60s. While I took a licking putting this Timex back together, it keeps on ticking! An interesting additon to my collection.